“Age is just a number” is a very old adage and many people swear by it. Despite their growing age, they prefer to keep the child inside them alive. The rest on the other hand feel that it’s better to come to terms with the old age and all the complications associated with it. R Balki handled this aspect beautifully in 2007 in CHEENI KUM wherein Amitabh Bachchan’s character at 64 was all set to get married while his to-be father-in-law, essayed by Paresh Rawal, was younger than his to-be son-in-law and was all set to become a ‘senior citizen’. Amitabh now gets into a kind of a similar zone with 102 NOT OUT. So does it turn out to be an ideal family entertainer? Or does it fail to evoke fun and madness? 102 NOT OUT is an unusual story of a father and a son. Dattatraya Vakharia (Amitabh Bachchan) is a healthy old man at the ripe age of 102. He’s full of life and aims to live for 16 more years to break the record of the oldest man alive on Earth. His son Babulal (Rishi Kapoor) meanwhile is around 75 and has lost interest in life. Dattatraya is unable to tolerate the negativity oozed by Babulal with regards to old age, death etc. and decides to become the first father ever to admit his son in an old-age home. Babulal is naturally shocked and livid at this decision of his father and he protests. Dattatraya, as a result, decides to put few conditions in front of Babulal that he needs to fulfill if he wants to stay in their sprawling bungalow. As Dattatraya starts to fulfill these conditions, he becomes more and more excited and child-like. But few of the conditions also require Babulal to confront some of the past demons, which is going to be a challenge. What happens next forms the rest of the story. The opening credits of the film are creative, showcasing some of the important landmarks of Mumbai, many of which are also a part of the film’s narrative. The introduction of all the 3 important characters – Dattatraya, Babulal and Dhiru (Jimit Trivedi) is quite funny and makes for a nice watch. The film is just 102 minutes long and hence, no time is wasted. The film comes right on track after the quick introduction and it’s hilarious to see Dattatraya trying to get his son admitted into an old age home. The sequence where he reads Babulal’s love letter raises lots of laughs. From here, the film slips a bit as the direction is a bit disjointed. But the film picks up slightly with the church sequence as a new angle is introduced at this point. Post-interval, this angle gets a lot of prominence and that’s where the film gets emotional. The sequence where Dattatraya narrates a terrible ordeal from their lives is heart-wrenching but also one of the best sequences of the film. The climax is clap worthy and also puts a smile on one’s face. 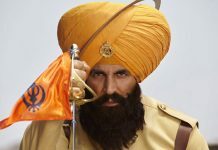 But in this process, the humour that one would expect after watching the funny promos of the film, might feel a bit let down as the second half is very serious, with very few laughs. Saumya Joshi’s story is novel, touching and gives a very important message. Saumya Joshi’s screenplay is effective, for most of the parts, but is too quick and slightly incoherent in the first half. For instance, the manner in which the film’s tone gets too emotional in the sequence when Babulal enters the park with the aeroplane is too quick and catches viewers unaware. Saumya Joshi’s dialogues however keep the fun and interest going and at places, are also quite acidic. Umesh Shukla’s direction is simple and neat. He struggles at a few places in the first half, but overall, he manages to leave a mark and ensure that viewers are moved and have laughed in equal measures. 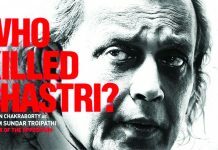 102 NOT OUT is adapted from a Gujarati play by the same name, directed by Saumya Joshi, and Umesh manages to get it on celluloid very well. At a few places, it does give you a feeling of a play but no complaints as such since the content is strong! 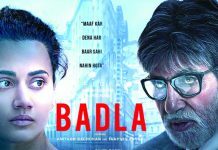 Amitabh Bachchan is in a great form yet again and delivers an outstanding performance. It’s amusing and endearing to see him playing a centenarian and still preferring to live life to the fullest. Even in the emotional scenes, he shines a lot. His Gujarati accent comes out well, but it’s not too in-your-face. Rishi Kapoor also puts his best foot forward and gets completely into the skin of his character. It’s nice to see him as an uptight senior citizen and his gradual transformation is also lovely. 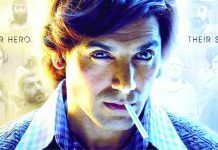 His best act is definitely in a crucial emotional sequence in the second half where he mouths no dialogues but communicates a lot simply through his expressions and eyes. Jimit Trivedi whose debut in BHOOL BULAIYAA (2007) was much talked about gives a yet another bravura performance. He also contributes a lot to the fun and emotional quotient of the film. Dharmendra Gohil (Amol) is decent in the lone sequence. Salim-Sulaiman’s music is hardly memorable. ‘Bachche Ki Jaan’ and ‘Kulfi’ both are played in the background and go well with the narrative. ‘Badumbaa’ is missing from the film. George Joseph’s background score however is quite exhilarating. Laxman Utkar’s cinematography is decent and the exterior shots of Mumbai are well captured. Bodhaditya Banerjee’s editing is slick, at times too quick, but overall fair. It’s commendable that a film with the title of 102 NOT OUT is actually 102 minutes long and kudos to the editor for managing it. Mansi Dhruv Mehta’s production design is appealing – the mansion looks quite rich. Veera Kapur Ee’s costume stylist is first-rate. The review would be incomplete without the mention of Preetisheel Singh’s make up, hair and prosthetics. She gives a great look to both the veteran actors which also turns out to be the film’s USP. 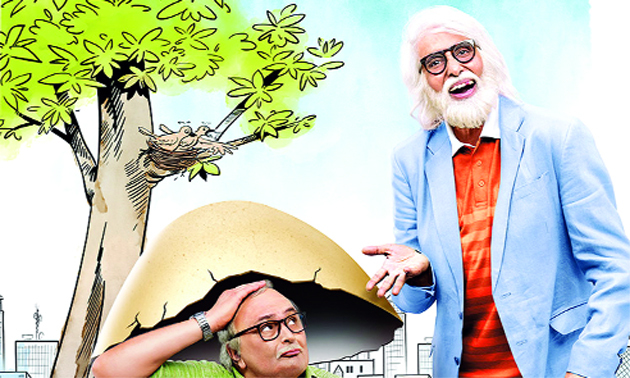 On the whole, 102 NOT OUT is a complete family entertainer with strong emotions as its trump card. It carries an important message for today’s times. At the box office, it will have a strong word of mouth and families are bound to flock to watch it in theatres. Recommended!